“The scale of the economic destruction in Syria is reminiscent of some nations after second world war”, a leading expert tells Syria Deeply. While Syria’s civil war has brought the country’s economy to its knees, a growing number of groups, individuals and militias are reaping million of dollars in profit from illegal activities such as kidnapping and smuggling, a leading expert has told Syria Deeply. A new business elite engaged primarily in traditional legal industry and trade is also emerging because many of the old guard have either died or left the country, Jihad Yazigi, editor of the Syria Report, said in an interview. The Syrian conflict, now in its fifth year, has taken a dramatic toll on the country’s economy. According to U.N. figures, the total economic loss from Syria’s conflict will reach $237bn by the end of this year. Exports and imports have both declined significantly and the country’s GDP has plummeted. Nevertheless, new and often illegal businesses have sprung up, as almost always happens in civil wars. Rebels and other groups are charging people to pass checkpoints and borders. Smugglers are meeting demand for all sorts of goods, both legal and illegal. Looting and kidnapping have also become rife. Behind the backdrop of the fragmentation of the Syrian infrastructure, as opposition and extremist groups and the government compete for resources and territory, new groups and individuals are taking control of the economy at the expense of the traditional business class, Yazigi said. Syria Deeply: What is a war economy and how has it developed in Syria? Yazigi: The war in Syria has not only destroyed its physical infrastructure such as factories, power plants and housing, but it has also destroyed business networks and pushed many businessmen outside the country, with their capital, knowledge and trading networks. All of this has led to a change in the economic relations and institutions inside Syria. In Syria today, new internal borders and products and services have been created, and a war economy has emerged where people, and the networks in which goods and services are traded, depend on the perpetuation of the war. For example, a common source of business income for armed groups whether affiliated to the opposition or the regime is the levying of transit fees at newly established border crossings and checkpoints, which consequently increases the cost of trade and goods within Syria. These people don’t have a fundamental interest in the war ending. Meanwhile, looting and kidnapping have become new sources of income and examples of new services and industries that were born in conflict. Since the beginning of the conflict, many people have left the country or died, others are getting poorer and some are no longer in good standing with the regime. Consequently, new people have taken their place and are making money out of the situation. The recent elections in the Aleppo Chamber of Industry is a telling example of this phenomenon: out of the 12 recently elected board members, 10 new figures emerged. There are also new institutions that have been created as a result of the war. For example, in the areas that are besieged by the regime, like in the Ghouta suburbs of Damascus, local councils manage the life of the inhabitants and ensure supplies of products and services. In the city of Manbij, near Aleppo, a police force and a workers union were established prior to its takeover by ISIS last year. The people working in these institutions don’t necessarily see themselves as beneficiaries of the war, but in practice, the power and wealth they have is a consequence of the war that has emerged. Syria Deeply: What is the state of Syria’s economy today? How is the regime faring? Yazigi: The Syrian economy is in very bad shape and the country is in large part destroyed. The percentage of those living in poverty and the unemployment rate are both believed to be over 50 percent. A large part of the production capacity of the country has been destroyed, including factories, land, power plants and irrigation systems, as well as tourism establishments. The size of GDP is believed to be below half of its level prior to 2010. Last year, GDP growth was negative but the decline was slower than previous years because there was stabilization in some areas. There’s been a small growth in sectors like manufacturing, but the total value of the products produced is much lower than 2012 levels. Syria had relatively little debt prior to the uprising. The country is now accumulating debt, and its foreign currency reserves have almost been entirely spent. The Syrian government relies to a good extent on financial support from Iran. Thanks to Iran, the government been able to supply enough oil products for the market, which is particularly important because Syria doesn’t produce oil any more. The government has also reduced all subsidies because it has a big problem in terms of generating revenue. It still manages to pay salaries and provide minimal level of services like education. At the end of the day, the Syrian state is relatively efficient and solid, and the government will always have enough money to pay salaries in Syrian pounds because it will always be able to print money. In terms of government spending and incomes, we are seeing very minimal levels of subsistence that allow people to eat and drink, but people are very poor and the situation will only get worse if the war doesn’t end soon. Syria Deeply: How is the regime able to recruit people and retain control over the population on the ground in light of these circumstances? How does Iran factor in? Yazigi: The regime is in a dire situation and facing trouble with recruitment. Just a couple days ago, it announced that it would be paying a salary of 10,000 Syrian pounds ($53) to every soldier that is fighting, and promised them one hot meal per day. We don’t have official data on the economic situation inside Syria and the number of troops and arms Iran is sending, but I believe the regime will always have enough money to retain a minimal level of fighting capacity and food supplies to feed its soldiers and their families. After all of Iran’s investment in Syria to date, it will not give up easily. Syria Deeply: How big of a threat is ISIS to Syria’s oil resources? Yazigi: In 2013, the regime lost the east of the country to Jabhat al-Nusra and later on to ISIS. In practice, what that meant is that it lost many of its most important oil fields, but until now has managed to retain control over its gas fields, which are located towards the west of the country, near Palmyra and to the east of Hama and Homs. Its capacity to hold on to these gas fields has enabled it to continue providing electricity to civilians. For the moment, the most important gas fields are still under government control, although ISIS is inching closer to them. If ISIS were to get a hold of these gas reserves, it will have a serious impact in terms of electricity production and gas supplies for the country. Control of the gas fields will give also ISIS a good bargaining chip with whomever it fights. Oil is easy to market – you produce and sell it in a barrel, but gas is much more complicated. ISIS will not be able to sell gas by itself. The idea is to trade with the regime by using control of the gas fields as a bargaining chip. In other words, selling the regime gas in return for arms or funding, etc. Syria Deeply: What is the fallout of opposition groups not being able to organize themselves and provide a stable alternative for civilians who are caught in between the regime and extremist groups? Yazigi: Outside the areas of regime control, ISIS areas are by far the best-managed. They have imposed taxes as a way of funding themselves, organized business activities and social rules that are without a doubt draconian, but if you respect these rules, you can have somewhat of a normal life. Because of the diversity of opposition groups, their capacity to manage has varied a lot. For instance, before Aleppo was barrel bombed by the regime, the local council was very efficient, which is probably why the regime attacked them – it wanted to wipe out any credible alternative to it. ISIS has never been bombed by the regime, which makes a major difference in its ability to organize itself. The feeling among all the communities in opposition held areas was a desire for self-management and autonomy as a result of not being able to do so in the past, so it’s been very hard for anyone managing those areas to impose rules on the civilian population. However, there are examples of efficient management of the communities in opposition-held territory. The opposition-held eastern part of Aleppo was a good example of a relatively well-managed city, however it became completely impossible to organize life there because of the continuous barrel-bomb attacks by the regime. It had up to a million residents before the barrel bombs. There was free media, and many civil society groups, doctors and teachers that have now left. 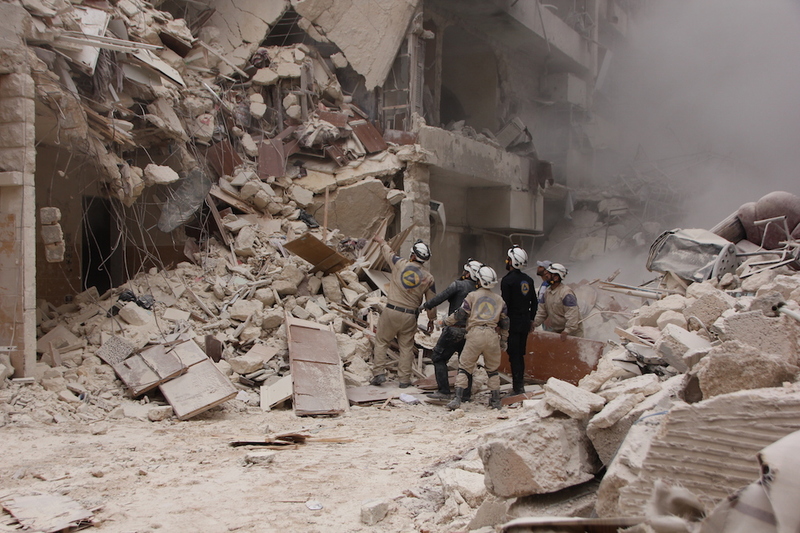 The biggest problem in Syria today is the targeting of civilians. The day you provide protection from barrel bombs, you’ll see a return of hundreds of thousands of refugees, a rebalance in the relationship between the civilians and the armed groups and evidence of what you saw in Syria before – well-organized life. Syria Deeply: What is the scale of destruction inside the country and how has this changed the demographics and economy of the country? Yazigi: More than half of the Syrian population has been displaced, with people living in areas they have never lived before, which is changing the demographics in the country. This is particularly true in the coastal areas. The Alawites are probably a minority in coastal areas today. On the other hand, there have been investments by people from Aleppo and Hamas in these coastal regions. Services and factories have opened, businesses in Latakia and Tartous, so these areas have benefited in some senses, but they have also lost a significant amount of people to the war. However, there are areas that have been emptied that won’t be inhabited again for a very long time – the suburbs of Damascus, Homs, Aleppo and Deir Ezzor. Even if the war ended today, millions of people wouldn’t have homes to return to. Syria Deeply: How much will it cost to rebuild Syria? What’s your forecast for the economy? Yazigi: A lot of people are looking forward to the huge reconstruction work that will eventually take place in Syria. It will take decades ,and a lot of people will make money rebuilding Syria. People are saying it will cost $200 billion to rebuild the country, which is three times the Syrian GDP prior to the conflict. Meanwhile, the economy will continue to get worse. Fundamentally, right now, there is nothing that favors an improvement of the economy as a whole. Even the sectors that are doing better now than last year, are still doing much worse than prior to the conflict. We don’t have the production capacity, any imports or exports, and people no longer have their savings so there is no consumption or investment in the country. Syria’s economy will not return to its level prior to the uprising for decades. In particularly, because we wont have anything similar to a Marshall Plan – a large infusion of capital in a framework of a well-defined plan for reconstruction. At the end of the day, capital is easy to bring, but you need qualified people and expertise to run the country, and unfortunately we’ve seen a huge outflow of the middle class. Not to mention that we will have a generation of Syrians that will be illiterate. The journalists, accountants, civil society activists, lawyers, doctors, academics and business managers have left the country – and they are what we need for society to function. When the middle class leaves, they often don’t return to their home country because of the lack of stability, capital or opportunities to create a livelihood. As an example, Syrians were the largest foreign investors in terms of numbers in Turkey last year. They opened restaurants, shops, small workshops, markets and they’ve established new lives. People who get jobs in Europe are unlikely to return.